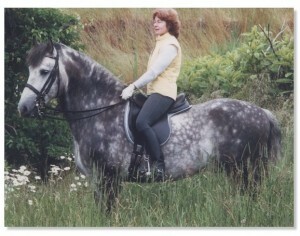 Home » Articles Of Interest » 2005 High Point Award Winner: Soldado H.H.F. 2005 High Point Award Winner: Soldado H.H.F. Spanish-Norman owner Petra Sherman is a unique and interesting personality. A true scholar and expert on the history of the horse and the art of classical equitation, Petra has a library includes equine books in six languages. Petra has always been an ardent devoteé of the Spanish horse. Born in the U.S., the daughter of a Dutch diplomat at the U.N., Petra studied in the Netherlands from age six on. 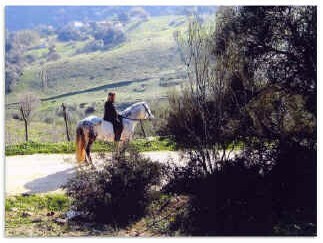 She lived for over 25 years on the Spanish island of Formentera with her beloved Andalusian, Arlequin. The two of of them used to enjoy daily rides in the Mediterranean Sea. Leaving Arlequin behind was a painful experience when Petra moved to the United States a few years ago to marry husband Frank and settle down on Cape Cod. Petra’s quest for the ideal horse led her to Hamid Hill Farm’s Spanish-Norman stallion Soldado H.H.F., sired by the Andalusian Embajador IX. Allan Hamid recalls: “I remember the day Petra came to see Soldado. I knew immediately it would be a perfect match. Petra’s enthusiasm for the breed is equal to her dedication to Soldado. There is an incredible bond between Petra and Sol. Linda and I are so glad she has shared her wonderful experiences with us all. 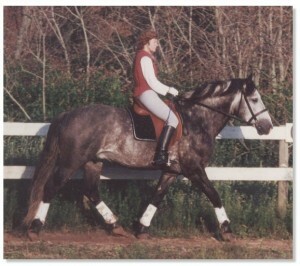 Soldado was a favorite with the audience at the Equine Affaire in W. Springfield, Massachusetts in November 1998 when he participated in the Spanish-Norman breed demonstration. Founded in 1991, the Spanish-Norman Horse Registry is the official licensed organization for recording and tracking the pedigrees of Spanish-Norman Horses. Our entertaining and educational DVD offers a comprehensive view of the Spanish-Norman Horse, a genetic and historical re-creation of the medieval warhorse of Europe. CLICK HERE for more information or to buy the DVD!